A coroner will raise concerns over the safety of railings at an aqueduct where a teenager fell to his death. Kristopher McDowell, of Cefn Mawr, Wrexham, died after falling from Pontcysyllte Aqueduct in May 2016. Coroner John Gittins said he will write a report about the size of the gaps between the railings, and another about a procedure used to test the safety of the railings. The jury at an inquest into the death recorded a conclusion of misadventure. Mr McDowell was holding onto an upright rail when it gave way and he fell 37m (120 ft). Mr Gittins said the Canal and Rivers Trust (CRT) must respond within 56 days, but stressed they were within their rights to say they believe no further action is needed. The coroner said "every indication" had been given to him by experts that the structure was safe for normal use. However, because he had concerns, he had a mandatory duty to issue a report. He gave his "sincere condolences" to the family, saying Mr McDowell "had a life ahead of him". The CRT said it would review the findings in detail and determine how to respond to the recommendations. The Ruthin inquest heard from Sally Boddy, a senior engineer with the CRT. Mrs Boddy said there had never been any problems recorded on the rail in question. "My only conclusion is that the load that was exerted... was not a normal loading," she said. "I'm convinced that our inspection process was robust, or is robust." Mrs Boddy said she was "sure" the rail would have been inspected and if any concerns were highlighted, they would have been "rectified". She told the inquest that "just because a hand rail is loose, it doesn't mean it's unsafe", but it could be disconcerting for the public. She was asked by the coroner, John Gittins, about the safety measures on the 19th Century aqueduct. Experts had, she said, suggested ideas such as installing a mesh to increase safety. These ideas were given "full consideration", she told the jury, but that with signage and rangers present at busier times, the CRT concluded after a safety review that Pontcysyllte "is safe for people to visit and enjoy, in normal use". "I do not think we can mitigate for every abnormal use of this structure," she added. The jury also heard from William Day, a civil engineer who counts CRT among his clients. He visited Pontcysyllte Aqueduct days after Mr McDowell's death. Tests undertaken showed that there was no issue regarding the safety of the parapet, the court heard. He said that he believes that the upright rail that came loose in Mr McDowell's hand was disengaged from the structure at the bottom, having been lifted by Mr McDowell. The jury was told that the gaps between the railings are on average wider than the modern standard of 110mm. "If this was built today, it would actually adhere to the modern standards", Mr Day said. Many structures that are listed or are scheduled monuments do not comply to modern standards, he said. "Yet the public is using these," he added. Mr Gittins instructed the jury to return a conclusion of accident or misadventure, and it returned the latter on Wednesday. 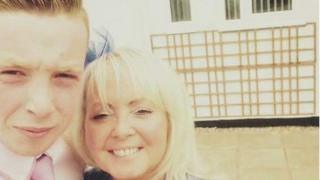 Speaking after the inquest, Mr McDowell's mother and stepfather, Sam and Steve Jackson, said in a statement: "Our beautiful son was taken from us at such a young age and the start of becoming a young man. "Kris was a very enthusiastic, loving and caring 18-year-old who loved life and cared about his family and friends."